Cheap flights from Brussels to Montreal from €268 return! Cheap return flights from Paris to famous Madagascar from €505! Star Alliance cheap flights from Paris to Boston from just €208 return! Cheap flights from Brussels to Montreal from €313 return! Book the cheapest flights to Montreal. Canada from Brussels thanks to latest promotion of Air Canada. (Star Alliance). Based on this carrier you can now book discounted non-stop tickets. Note that fare is for a round trip flight and inclusive of all taxes and fees however there is no longer checked-in bag in base fare. (Available for extra cost). Take advantage of this current promotional sale of Air Canada and book cheap flights from Brussels to Montreal in autumn 2018 or spring 2019. *UPDATE*. : Adding solution with SkyTeam airlines Air France / KLM next spring available already for €268! (With one layover in Amsterdam or Paris). Air Canada promotion is running till 15th of September. You will find the cheapest flights from Brussels to Montreal when traveling from 26th of September to 29th of October 2018 or 29th of April to 23rd of June 2019. Also latest date of your inbound flight back to Belgium. Below you can refer to our booking sample of cheap flight Brussels-Montreal and few travel options. Montreal is the metropolis of the province of Quebec. Quebec City is the political capital but Montreal is the cultural and economic capital of Quebec and the main entry point to the province. The second largest city in Canada, it is a city rich in culture and history and a well-deserved reputation as one of the liveliest cities in North America. Montreal is the second-largest French-speaking (as a mother language) city in the world, behind Paris. The population of Montreal is about 1.9 million, with 4 million in the metro area. Montreal is sometimes referred to as The Paris of Canada. If you have booked these cheap flights from Brussels to Montreal you can read more about this famous city at Wikitravel. Travel dates. : You can compare all the cheapest travel options directly at website of carrier. If you are about to book these cheap flights from Brussels to Montreal you will probably need some affordable accommodation as well. To look up cheap accommodation in Montreal you may consider booking sites such as Hotels.com or Booking.com. You can save some decent money off accommodation in Montreal when using following offers. 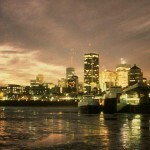 Booking sample of cheap flights from Brussels to Montreal from €268 return! In this case you would depart from Belgium to Canada on 4th of June. Your return flight from North America back to Benelux would be on 12th of June 2019. Take advantage of this great promotion and book very cheap flights Brussels-Montreal this year or next spring / beginning of summer.